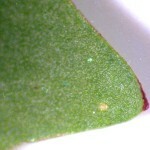 Home Dicots Those elusive yellow composites! 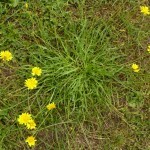 We’ve all been there, gently identifying plants in the lawn and behold, a yellow Dandelion-like plant! Behold a yellow Dandelion-like plant. But IS it a Dandelion? Perhaps it’s a Sow Thistle? 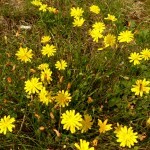 Or maybe a Hawkbit? Or do I mean a Hawk’s-beard? Oh no! is it a Cat’s-ear? Arrrgh! Perish the thought, could it be a Hawkweed?! There are a lot of candidates to be sure and Dr M has never found the common names very memorable or helpful in distinguishing this diverse but superficially rather similar group! But listen to the plant and examine the leaves, stems and flowers carefully and you will soon be able to get to a genus with confidence! 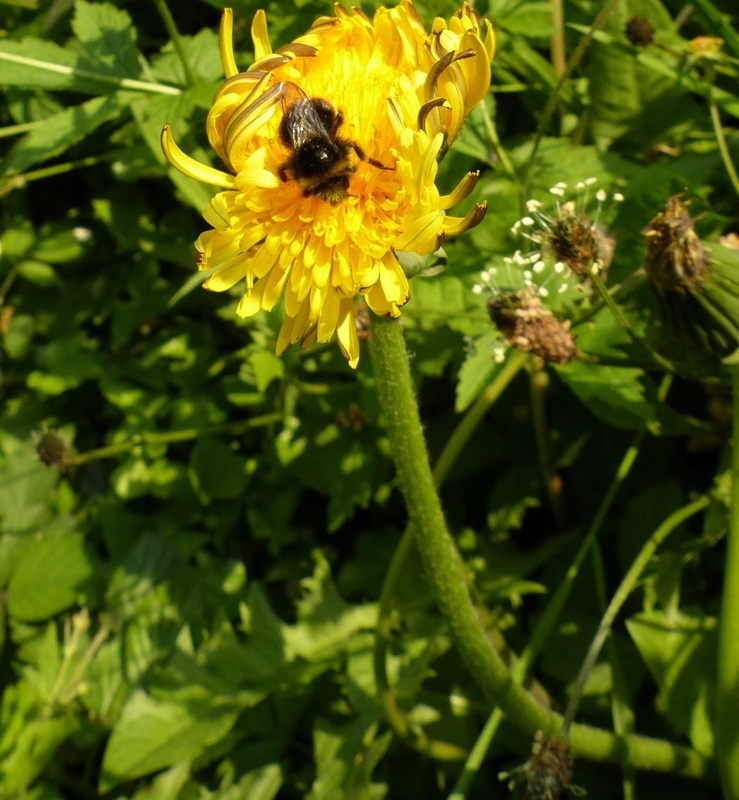 Check the flower stem, if it is unbranched and hollow with white latex and with a single capitulum (head) and the leaves confined to a basal rosette, it’s a Dandelion, Taraxacum species. Actually a very complex and difficult group with hundreds of apomictic microspecies. 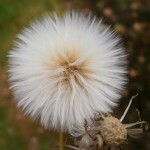 The common and garden Dandelions will usually fit: Taraxacum officinale agg. 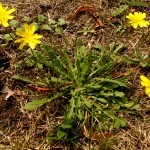 or Taraxacum section Ruderalia! 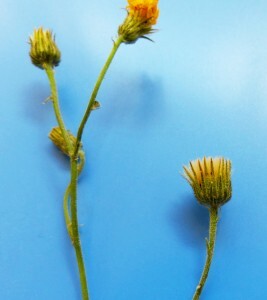 This is the most thistle-like of the yellow composites so pretty easy to tell from the others. 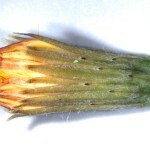 In Sow Thistles the flower stems are hollow but branched (so not a Dandelion) with white latex turning orange with time and with glaucous or bright green leafy stems and leaves with auricles. Common Sow Thistles, Like Sonchus asper (Prickly Sow Thistle illustrated) tend to be weeds so you wont find this in grassland unless it is growing in trampled or otherwise disturbed areas. All the rest have solid flower stems. If the flower stem is unbranched and leafless with leaves in a basal rosette only and very hairy and with forked hairs then it’s a Hawkbit (Leontodon spp.) 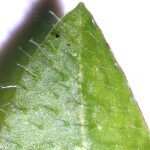 and what’s more if the forked hairs on the midrib above have red bases than it is Lesser Hawkbit (Leontodon saxatalis). 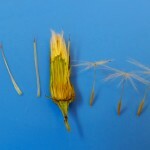 The Hawk’s-beards (Crepis spp.) 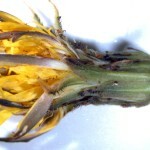 have branched flower stem with hairy or hairless leaves, the important thing though is the capitulum has just two rows of phyllaries (the bracts on the capitulum), one short row and one longer and the pappus hairs are white and simple (not feathery). 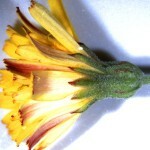 Crepis capillaris (Smooth Hawk’s-beard) is the common one in lawns, grasslands and waste places). 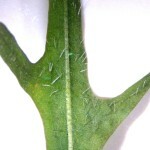 If the flower stem is branched, leafless and the basal rosette leaves are very hairy but without forked hairs, it could be a cat’s ear. Check the capitulum and if there are extra scales in the capitulum (receptacular scales) amongst the achenes which have a brownish pappus with both simple and feathery hairs, then it is a Cat’s-ear. 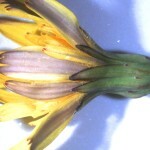 Hypochaeris radicata (sometimes spelled Hypochoeris – Common Cat’s-ear) is the common one in lawns and neutral grasslands and meadows. 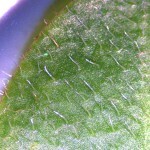 This is another complex group with hundreds of apomictic micro-species. 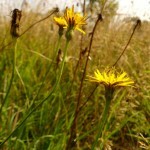 Hawkweeds (Hieracium spp.) 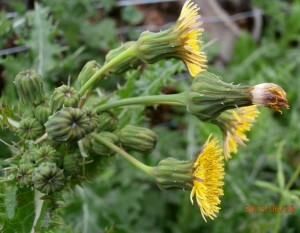 are usually hairy often with multicellular hairs and branched and leafy flower stems and the capitulum with many overlapping rows of phyllaries. Dr M says: I hope this post is useful in helping you distinguish between the various possible alternative yellow composites. Contact Dr M with your thoughts and tips for this helping with these yellow devils! Thanks for posting the photos with your descriptions – it makes understanding the features much easier. I’m going to get my A Level biology group to identify a couple of these plants this afternoon; using this page as their ID guide. It worked! They now know the difference between dandelions and Hawk’s-beard! “Common Sow Thistles, Like Sonchus asper (Prickly Sow Thistle illustrated) tend to be weeds ” True, but S. asper is a common plant of sea cliffs on Skye & Raasay. Thanks for that useful breakdown. I’ve always found the common names unhelpful too. Too many cats and hawks and beards and ears.